Home / Front Page/ President advances reconvening of Parliament to 14 Nov.
President advances reconvening of Parliament to 14 Nov. 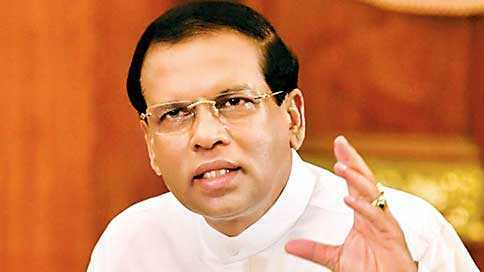 In a Gazette notification issued last night, the President summoned Parliament to meet at 10.00 a.m. on 14 November. Previously he had fixed 16 November as the date for the new session of the House to commence after its prorogation on 27 October. Analysts said by advancing the sitting date, the President is no doubt trying to diminish the growing pressure on him, both locally and internationally, to act constitutionally and allow Parliament to resolve the impasse that the country has been pushed into after his sudden decision to remove Ranil Wickremesinghe from the post of Prime Minister and replace him with Mahinda Rajapaksa. Last night’s announcement comes after much speculation throughout last week that the President would enable the House to meet earlier. Last Thursday he told four new Ambassadors, including the new US Ambassador to Sri Lanka Alaina B. Teplitz, whom he spoke to after they presented their credentials to him, that Parliament would meet on 5 November. His newly-appointed Prime Minister Mahinda Rajapaksa also announced the date to a group of journalists the same day only to have it denied a few hours later by his party men. The following day, on Friday, when a group of over 100 MPs met with Speaker Kaur Jayasuriya to hand over a letter requesting him to immediately summon Parliament, the Speaker told the group that the President had told him he would do so by 7 November. However, the President has now reneged on his previous words and set a new date which is unlike to please anyone except those in the Mahinda Rajapaksa camp. Parliament can be summoned after a prorogation with notice given three days in advance. The President’s decision to delay it by more than a week shows that the magic number of 113 that is needed to show a simple majority in the House is still eluding him and the new government. Since Rajapaksa’s appointment on 26 October, he has been making piecemeal ministerial appointments, clearly playing a waiting game till more from the opposition ranks cross over to his side. Meanwhile, Speaker Karu Jayasuriya, who has been under tremendous pressure to defy the President and convene Parliament on his own, is slated to make an announcement today in response to the President’s latest announcement. Despite legal opinions being expressed that the Speaker has the power to summon Parliament after a prorogation, he has remained tight-lipped and non-committal about the matter knowing such a drastic measure could tip the country, already on shaky ground, into a political abyss. The Sri Lanka Freedom Party (SLFP) led United People’s Freedom Alliance (UPFA) has organised a massive rally near the Parliament for this evening. They are expecting to bus in thousands of supporters as a show of force. The choice of the Parliament roundabout as the venue seems symbolic for the group, which, though short of numbers in Parliament at present, is no doubt hoping that seeing the crowds will entice more MPs to join their ranks.